Iowa Senator Tom Harkin met Tuesday with President Obama’s Supreme Court nominee Sonia Sotomayor. Harkin says he’d be very pleased if Sotomayor becomes the first Hispanic justice on the nation’s highest court. "She’s an extremely impressive individual, very bright and really knows the law," Harkin says. "Based on everything we know right now, she’s a superbly qualified person to serve on the Supreme Court. I do support (the) timetable to begin hearings in the Judiciary Committee on July 13th so the full Senate can vote on her nomination before the August recess." When Sotomayor was nominated to a federal appeals court in 1998, Democrat Harkin voted "yes" on her confirmation, while Republican Iowa Senator Chuck Grassley voted "no." President Obama signed a bill into law this week giving the FDA new powers over tobacco companies, legislation Iowa Senator Tom Harkin first introduced more than a decade ago. Harkin says he co-sponsored the original incarnation of the bill in 1998 and says it’s passage "was a long time coming." "What the bill will do is, it’s going to give the FDA the authority to regulate and to get information on all the ingredients that go into tobacco," Harkin says. "We’re also going to, FDA’s going to put different warning labels, they’re going to be huge warning labels on packs of cigarettes now and other tobacco sources." 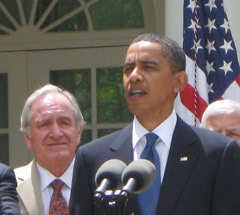 Harkin attended the White House Rose Garden ceremony on Monday. He says the new law will allow federal regulators to obtain and publish complete lists of everything cigarette makers put into their products — and what smokers put into their lungs. "For example, we know that tobacco companies now put ammonia in tobacco which heightens the absorption of nicotine," Harkin says. "The FDA would never allow, for example, Kraft Foods to put ammonia in their macaroni and cheese." Harkin says he chose to highlight Kraft as its parent company is Altria, which also owns tobacco giant Phillip Morris. In a release this week, Harkin said: "This bill is about standing up to the power of Big Tobacco, standing up for our children and fighting back against the number-one cause of preventable death in this country. This law will spare millions of Americans the ravages of completely avoidable disease, disability, and death."